Create with Gwen: Bonus Days Coupon! This is the first time Stampin' Up! has offered this type of promotion! For every $50 order from July 7 through July 31 (before shipping and tax), you’ll get a $5 Bonus Days coupon that you can use from August 2 through August 31. YES! Did you get everything you want from the new annual catalog yet? Since it only came out a month ago, you probably still have some items on your wish list, and we have some great news for you! This is a great opportunity to shop from your wish list, whether you buy your favorite products now or later in August with your coupons! • An email address is required to participate in this promotion. 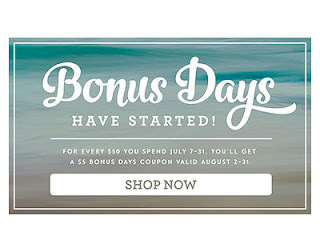 Bonus Days coupon codes can only be delivered via email. Don't forget...use my July Rewards Code when ordering for the opportunity to be entered for even more rewards. And be sure to print and record your Create Happy Rewards!